A spirited guide to the wine lists, menus, and barroom scenes at some of the best restaurants in town. Perch yourself on a bar stool at a tony restaurant, and youre more than an ordinary diner; you become an observer of a drama played out nightly. 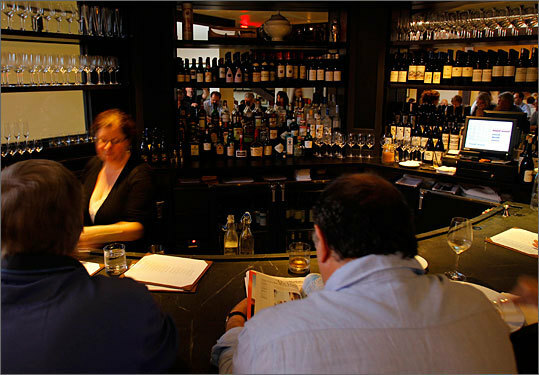 Bar seats are the most intimate in the house, places where you can eavesdrop as staff interact with fussy eaters, see whether the bartender is checking freshly opened bottles for corkiness (few do), and get a peek at what the back of the house likes to sip and nibble. In the past several years, a number of new restaurants have started offering intriguing arrays of wines by the glass and inventive small-plate menus to go with them. Snacks presented in perfect golf ball-like rounds, many deep-fried, are popping up everywhere (salt cod fritters at Catalyst in Cambridge, salmon tartare at AKA Bistro in Lincoln, arancini at 62 Restaurant in Salem), and all manner of creamy spreads and savory fillings served with superb artisan breads (duck liver pate at Deauxave in the Back Bay, smoked bluefish pate at Legal Harborside in Boston, grilled cheese at Towne Stove and Spirits in the Back Bay) are also in fashion. Barkeeps who know their wine lists are happy to discuss the Finger Lakes Riesling or village Burgundy youve got your eye on, and if equally well versed in the menu, will enthusiastically provide the juicy details of every dish. A duo can tuck into a corner of the bar, try two wines and two apps for between $40 and $50, and decide whether a return trip to sample the full menu is in order or whether to content themselves with an encore performance from the very same seats  no reservations required. Boxy banquettes and calming earth tones envelop you at the sleek bar. Chef Antonio Bettencourt makes stellar small plates, including polpette (beef, pork, and ricotta meatballs) in tomato sauce on polenta and arancini (crisp, golden risotto rounds with a surprise center of mozzarella) in intense tomato confit (above). At $10, the quartino (two-glass carafe) of Sigl Federspiel gruner veltliner proved an excellent value. The Carpene Malvolti prosecco gave us a chance to re-sample a favorite bubbly. We passed up a special of ravioli filled with osso bucco, garnished with gremolata, which would have led to a juicy barbera dAsti we were eyeing. This cozy garret, one flight up at the train depot in Concord, is striking in its simplicity and good taste. The bar spills over to several tables and a curved counter-height table, where you can sit on backless stools or stand, like at a tapas bar in Madrid. We started off with a distinctly aromatic Entre-Deux-Mers sauvignon blanc blend alongside a tuna tartare appetizer thats light and beautifully fresh-tasting, then shifted gears to a thick burger on brioche with homemade pickles  brilliant. Our Jean-Maurice Raffault Chinon didnt seem all it should be (we were pretty sure it was a faulty bottle). The sommelier didnt agree, but he was awfully nice about assuring us we had it all wrong. The neighborhood in Kendall Square where Abigails opened recently is almost uncharted territory. James Ludwig, an East Coast Grill grad, and his wife, Sarah Murnane, offer inexpensive nibbles such as the whimsical green bean sandwich with roasted garlic and bean puree on crusty bread that was on the early fall menu. A juicy burger with special sauce, slaw, and American cheese is a filling little plate. The wine list is competent, dominated by mid-priced bottles from producers with name recognition. We liked the fresh-faced La Sablette Muscadet from Marcel Martin with the sandwich and the pretty Latour Domaine de Valmoissine pinot noir with our burger. Apartments upstairs start at $2,500 a month, but this restaurant keeps prices reasonable so the techies will fill the seats. Which they do. Youll find a French menu and a Japanese menu, each one with many smaller plates. We ordered a snack from each and watched our salmon tartare being made then spooned into salty-sweet rice baskets garnished with shiso leaves. The salmon comes in two generous portions; its delicious with a mild shoyu flavoring. With it, we chose Kip Kumlers crispy, crunchy green apple-y 2010 Turtle Creek chardonnay. Talk about hyperlocal: The vineyard is just down the road. From the French menu we had os a moelle, a roasted 8-inch beef bone, halved lengthwise, its rich marrow ready for rugged fleur de sel and grilled country bread. Youll want Drouhins elegant 2009 Cotes de Nuits-Villages with this. For sheer variety and interest, nothing in the wine-and-small-bites department surpasses this agreeable spot. Chef Paul Wahlberg and his star brothers Mark and Donnie own this large establishment on a cove in Hingham. The night we visited recently, the bar was three deep. We waited 45 minutes for a seat, sipping a sweet little pinot grigio from the Alto Adige. A couple of spots opened up, and the food came quickly. We finished off our white wine with a plate of beautifully crisp, thick cod cakes then moved on to a set of tender, porky meatballs and a generous plate of salumi (mortadella, prosciutto, salami) with grilled bread and a ripasso-enriched Valpolicella from Masi. The place is a scene all right. A hip spot with industrial decor and a wood-fired oven, Area Four is co-owned by Michael Leviton, chef of Lumiere in Newton. Area Four is one of the few places in town where pretty much all the wine is dispensed from kegs and served by the glass, half liter, and liter bottle. Here its easy to let a half liter of one versatile wine take you the distance, whether white or red, as we did with the appealingly fresh and thirst-quenching Elqui Valley Pedro Ximenez. The margherita pizza with mozzarella, tomatoes, and pecorino is as perfect as pizza gets. A little dish of meatballs on the specials list one night is as perfect as meatballs get. In their taupe shirts, the bartenders practically blend into the taupe walls; they are ever-present but unobtrusive. Fried oysters from the appetizer menu come with fresh corn kernels, black-eyed peas, slivers of bacon, and an haute tartar sauce  actually potato aioli. Spicy little merguez lamb sausages accompanied by hot and sweet peppers, hummus, and crumbled feta are memorable. Sommelier Kai Gagnon has put together the most personal, dish-specific list around, with a number of wines available only by the glass at the bar. With our oysters we happily sipped the beautifully aromatic 2009 Benderhof Riesling Trocken Mergel, then we shifted gears to the lamb with the spot-on 2009 Roagna dolcetto dAlba. This just may be the happiest little bar on either side of the Charles. In the Financial District near the Rose Fitzgerald Kennedy Greenway, this small bar, with orange stools that might have come from IKEA, is a surprise. The bartender knows lots of customers or at least acts like theyre regulars. Jason Santos of Hells Kitchen fame is cooking up high-tech wonders for the regular menu. At the bar, gnocchi with butternut squash, spinach, and toasted walnuts is a sweet dish. We opted to drink the cool, fruity 2010 Martin Codax Rias Baixas Albarino with ours. The exceptional menu item is a kobe beef burger with outstanding gaufrette fries (they look like tick-tack-toe boards), a pair of fat onion rings, and a plump, sour pickle. The lively, juicy 2009 Damilano barbera dAsti cuts the beefy richness in the nicest way. If you want a startlingly delicious burger in a funky setting, come here. At this new Cambridge eatery opened by former Four Seasons chef William Kovel, youll sit on roomy stools along a magnificent black granite bar, facing a wall of reclaimed barn boards. It sounds odd, but with lots of glass and a spacious setting, the effect is stunning. Presiding here is beverage manager Jason Kilgore, who has put together a wine list with a French tilt. Crispy pork rillettes with especially juicy centers are a delicious surprise. Curried chicken salad, heaped on toasted brioche, is served with blond fries that are surprisingly crisp and good. A special of feathery, golden salt cod fritter balls in a black cocotte comes with creamy dipping sauce. Pair them with the Cortijo III white Rioja, and sip the lightly sparkling, strawberry-inflected Pierre Sparr cremant dAlsace rose with pretty much anything. The food, drink, and decor define Boston in the 21st century. Pronounced here as doo-ahv, this beautiful restaurant sits where Massachusetts and Commonwealth avenues meet (deux means two in French). A thick marble bar curves gracefully where the windows bow. You get a lot of attention and high-quality stemware, flatware, and linens. Nine-hour French onion soup comes in the classic tall white bowl on a folded napkin, the broth like elixir, the cheese just right. With it we sipped the Varichon & Clerc blanc de blancs, a seldom seen sparkler from the foothills of the French Alps thats minerally and brisk. Duck liver pate, with its garnish of vanilla-poached pears, is silky and nicely set off by the generous 2009 Falesco Umbria sangiovese. Even the butter is perfect: a glorious little nubbin of French Echire. This elegant restaurant has a Michelin-star quality. A very friendly spot in a renovated Belmont firehouse, Il Casale is owned by chef Dante de Magistris and his family. You begin with dense, spongy, but crusty homemade bread and a bottle of olive oil  keep eating it and you may not want to order. Then youd miss a white bean and tiny Maine shrimp salad, Italian burrata (think really creamy mozzarella), or tagliatelle with a six-meat Bolognese (add mortadella and pancetta to the usual lineup). We had the deliciously sudsy, red Villa di Corlo Lambrusco Grasparossa di Castelvetro with the tagliatelle, and the 2008 Cantini Filippi Soave is a fine match with the shrimp-and-bean dish. Belmonters tuck in early, so youll have the place to yourself after 9 p.m.
Shuckers race to keep the raw bar hopping. Oyster sliders are juicy, fried nuggets in homemade brioche with lime-chili aioli. The dish of shelled mussels in saffron sauce with smoked paprika and Israeli couscous is divine. You expect the wines to be shellfish-friendly here  and you wont be disappointed. The list is packed with value-oriented, terroir-driven surprises. We were happy with the citrus-bright 2010 Saint-Bris sauvignon blanc from Simmonet-Febvre and the frankly delicious Leitz Out 2009 Rheingau Riesling from Johannes Leitz. Bar staff in T-shirts are low-key and just attentive enough; the atmosphere is delightfully boisterous and cheery. We cracked the code on getting into the fancy Floor 2 bar: Go at 6 p.m. Its empty and you get the ocean view at the tail end of the magical hour. Octopus mortadella is a gutsy, glorious dish  a round, white mosaic topped with raw-zucchini salad and good olive oil. The bread basket has a nice, big-seeded cracker and sweet mini corn muffins. Bluefish pate on toast, topped with a kind of golden-raisin chutney, was unfortunately stone-cold on our visit. We opted for a pair of Oregon whites to give some acid counterpoint. The 2009 Lemelson Willamette Valley Riesling and the 2010 Adelsheim Bryan Creek Vineyard pinot blanc proved satisfyingly bright and refreshing, though both were delivered frigid. The level of attention should be better, but go to see what everyones talking about. You might think that the restaurant inside the pricey retailer Louis would be ridiculously expensive, but here the very cheap bar snacks, $5 each, include spicy nuts, hummus with fried pita chips, and bright haricots verts with thick romesco sauce. Sams offers a reasonable menu with Fan Piers stunning water view  at least until the building going up next door blocks some of it. The tiny bar with its friendly staff in T-shirts is extra-welcoming, and the wine list is similarly laid-back (OK, it needs some perking up, but youll find something to like). We sipped a rather clumsy Olivet Lane Russian River Valley chardonnay, then hit the mark with a lovely, bone-dry Provencal rose from Chateau du Rouet. On the way out, sign the blackboard wall. Its washed down regularly, so if you want to keep your John Hancock up, you have to keep coming back. Choose any bar in this multitiered, clubby restaurant next to the Prudential; all menus are identical. We settled into the marble bar on the first floor, though our handsome barkeep didnt seem terribly interested in his work. Here Jasper White and Lydia Shire offer bold versions of familiar dishes. Our BLT made with late-harvest tomatoes and thick bacon was luscious and matched beautifully a pleasantly floral 2010 Domaine de Gournier, a country wine from the Cevennes. Grilled cheddar with fig preserves managed to be crisp and gooey alongside the suavely fruity 2008 Fogdog Sonoma Coast pinot noir. Call it comfort food in spiked heels. Sheryl Julian is the Globes food editor, and Stephen Meuse writes about wine. Julian can be reached at julian@globe.com, and Meuse at bytheglass@globe.com.